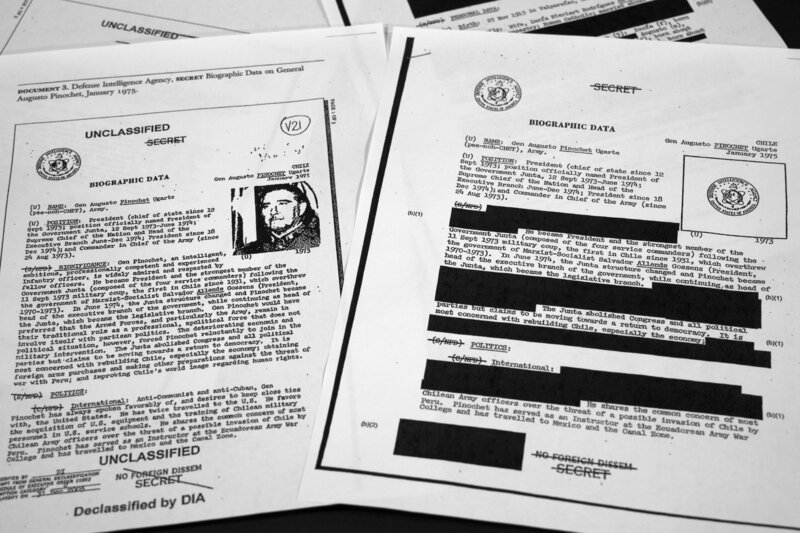 The National Security Archive, an advocate for open government, had for years tried to gain access to intelligence files about the Chilean dictator, his human rights abuses and his ties to the United States. In 2003, the Defense Intelligence Agency declassified documents that included a biographical sketch of Pinochet assembled in 1975, two years after he seized power. Parts of the sketch had been blacked out, “redacted,” for national security. The archive had no trouble discovering that the missing information included Pinochet’s liking for scotch and pisco sours. — Some files from World War I, including a method for opening sealed letters without detection and a formula for German secret ink, were not declassified until 2011. “When historical information is no longer sensitive, we take seriously our responsibility to share it with the American people,” CIA Director Leon Panetta said at the time. (The release followed years of lawsuits and formal requests). — The redaction in 2014 of remarks about the Cuban Missile Crisis made 50 years earlier by Soviet leader Nikita Khrushchev. The remarks were made in a public speech. — FBI files about Marilyn Monroe’s alleged Communist sympathies were redacted until 2012, 50 years after her death and more than 20 years after the Cold War ended.